The game gives you a chance to help the twelve Months overcome an evil witch - otherwise the seasons will never revolve; only darkness will reign over the world. The Months are twelve brothers and sisters, which use their magic power and artifacts to rule the Nature. Plunge into this fabulous story with match3 and i-spy levels and help them! Each of the Months is remarkable for his or her special powers, place of residence and traits of character. For example, January looks like a mighty King of the Middle Ages, February is an old bearded alchemist, March resembles a young Indian girl, etc. As you go ahead, you will release all the Months one by one and see the fantastic places where they live. 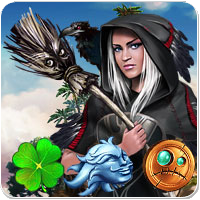 Moreover, the Months will let you use their magic power when fighting with the witch! The gameplay is absorbing and never monotonous - match3 levels alternate with i-spy mini-games and puzzles, so the player does not get bored. The background images of rare beauty, elaborate animation and soundtracks of pop-hit quality guarantee visual and acoustic pleasure. Apart from Story mode, the game also features Arcade mode. The "collapse" mechanics of the game is close to match3, but you should not move the items, just click on groups of matching ones, and they will blow up. It may seem easy, but in fact some of the levels are really challenging - the evil witch freezes the items, plants bombs and missiles, uses walls and ice crystals. Besides, arcade elements appear in the structure of the playing area. The witch is a tough egg, and it would be impossible to overcome her but for the Months. They will give you 12 mighty artifacts that can break walls, blow up or remove large numbers of items, etc. You must activate such artifacts by picking up groups of corresponding items. Besides, you can always use the witch's bombs and missiles to your own benefit.